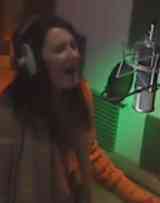 This week, newly signed to my Wobbly Music label, a young band from Southport came in to record their début single. My Christmas got off to a great start with a Video Xperience session with Sam Higham. Sam arrived at the studio at 6pm on Christmas Eve, and left, DVD in hand, at 12:45am on Christmas Day! Sam had originally planned to sing with his sister, but unfortunately she couldn’t make it on the day. However, Sam thoroughly enjoyed the Xperience! Sam brought a number of different backing tracks, and after doing a mic test with a couple of songs, he finally decided to sing this much loved Lennon & McCartney number. Check out the video below! More videos coming soon! Watch this space! It’s taken me a long time to get around to editing this footage, but at last I can bring you a “behind the scenes” look at the session from Journeyman in October 2010.